The Buffalo Bills and Ralph Wilson Stadium played host to a Motorola punt, pass and kick competition Tuesday for some excited Bills fans. The scoreboard was up and running for the lively competition and the public address announcer was on hand to introduce contestants. 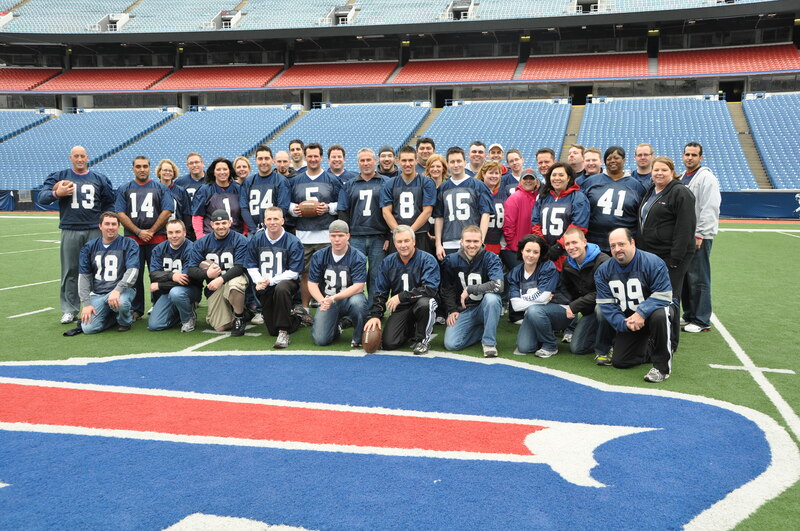 Motorola, a valued NFL and Bills partner, entertained 50 of their special guests. The fans ran through the tunnel, saw themselves on the Diamond Vision board and got a feel for what it’s like to compete on the field at the Ralph. All guests received a jersey and participated in three events; catching punts, punting and throwing. The top three scorers were then entered into a field goal competition and the grand prize winner received an autographed Bills helmet. The remaining finalists all received prizes from Motorola. All contestants were treated to a reception in the Player’s Club at Ralph Wilson Stadium following the event’s conclusion. Here’s a shot of the lucky group. Win a Bills prize pack! Hey Bills fans! Now is the time for a chance to win an exclusive Bills prize pack from D’Youville College! The prize pack includes a customized, authentic Bills jersey and an autographed football! Enter now! Having not played a game in Ralph Wilson Stadium for 35 days, the Bills players and head coach were grateful for the support they got in a tight game against Detroit. “Our fans are phenomenal,” said Kyle Williams. “When they’re here, they’re here and they give us what they’ve got. So I think it’s only fair that I give them what I’ve got. I think everybody here will tell you that. While working Saturday evening at the Hall of Fame ceremonies dozens of Bills fans approached me and my website co-workers thanking us for providing you all with a constant stream of news (written and video) about the team on a daily basis. Fans from Florida, North Carolina, Michigan, Virginia, Pennsylvania, Ohio and back home in Western New York all expressed genuine appreciation for what we provide for you guys on Buffalobills.com in Canton last night. On behalf of our staff of four which includes Gregg Pastore, Jeff Matthews, Mike Adamek and myself, I just wanted to say we appreciate every kind word you folks gave us Saturday evening. We’re not as large as a good number of the other staffs for the other teams in the league, but we pride ourselves on getting as much Bills info as we can out to you dedicated fans as we possibly can. To get the amount of positive feedback we got from you folks last night really made all the hard work that we put in worth it. As Mr. Wilson so aptly noted in his speech without you he would not have been on that stage last night. And the case is much the same for us at Buffalobills.com. Without you passionate fans we would not have the audience to provide what we bring to the website every day. Thanks very much for being the best fans I know I have ever come across. Collectively you are something special. Enjoy the rest of the weekend because it truly does belong to you.